Personal struggles and successes in a clash of cultures. 16"x20", with a stipple drawing of Quanah Parker by young Comanche artist Austin McClung. Buy a poster and save $30 on a ticket! The oral history documentary film will premier in up to 33 Texas and Oklahoma cities Sept-Nov 2019. Learn more. 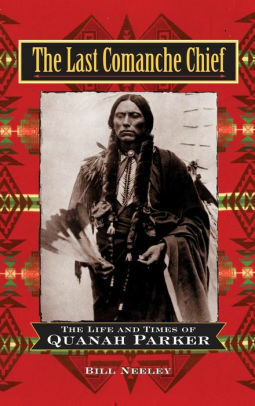 The Last Comanche Chief: The Life and Times of Quanah Parker by Bill Neeley is the seminal book on Chief Quanah Parker. This project, currently in the filming stage, has already recorded interviews with 22 of Quanah Parker's descendants. More interviews are happening soon. The film will premier in up to 33 Texas and Oklahoma towns and cities September-November 2019. Reserve your tickets now for the premier near you. The idea began with the filming of several Quanah Parker descendants as part of a Texas and Comanche Oral History Project (working title). Getting these oral history interviews on film with the goal of making them available as oral history VODs (Videos On Demand) on the internet was intriguing because they would be especially helpful to researchers, history authors, and teachers. Yet during the first filming sessions, as 22 of Quanah Parker's descendants told their stories, a much larger discussion and widespread interest developed, both among those who told their stories to the camera lens and the film team behind that lens. Not only Quanah's descendants, but other Comanches and those into whose culture these proud people melded – they all were part of a powerful clash of cultures that impacted their shared heritage. The multiple expressions of struggles and successes of moving from dominance as Lords of the Plains, "free as the wind for 240 years in Comancheria" with an unwritten language and living off the "entire width of nature” to a European settler's culture highlighted a need to tell as much of the larger story as possible. But that would be a major endeavor requiring substantial funding. Where to begin? Help us kickstart the telling of this generations-long story. The idea was born. A documentary threading together snippets from as many as 60 oral history interviews – Comanches, many of them descendants of Quanah Parker, along with some non-Comanches – illustrating the story of Comancheria, Cynthia Ann Parker, Quanah Parker, coming to the reservation, and acculturation as told by a widely-recognized and award-winning team of storytellers focused on original historical documentation. Reserve your tickets now for the premier near you. This Comanche Oral History Documentary is phase 1. It will kickstart either a full-length documentary, a television/streaming special series, or a major movie. Each would be factual and as complete as possible, based on the seminal book The Last Comanche Chief: The Life and Times of Quanah Parker, written by Bill Neeley and published in 1995 by the New York publisher John Wylie & Sons. Achievement of any of these three depends on our obtaining major financing, and that search is underway. 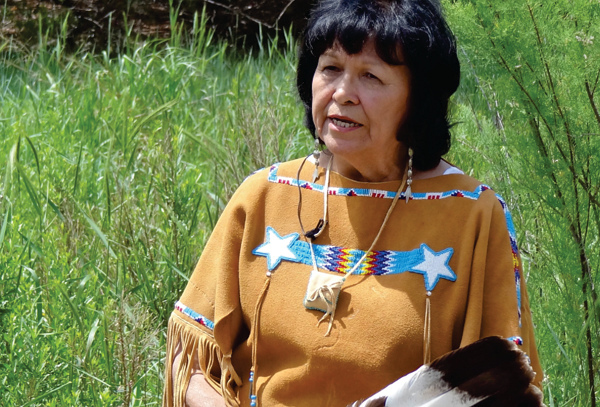 The core concern of our team is that we tell the deeply human story of both Cynthia Ann Parker and her son Quanah Parker as they encountered two colliding cultures. It is a story that needs to be told to a worldwide audience in a compelling and comprehensive way, so viewers can identify with them and be inspired by the strength of spirit Cynthia Ann and Quanah both found deep in themselves. Our hope is to portray honestly the profound loss each encountered and the redemptive force each became. Bill Neeley, author, Lawton, OK, NeeleyBooks.com. 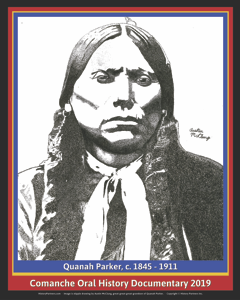 The Last Comanche Chief: The Life and Times of Quanah Parker. New York: John Wylie & Sons, 1995. David Rennke, award-winning Native American film producer, Mesquite, TX. Andrew Horton, Ph.D., Professor Emeritus, Film & Media Studies, University of Oklahoma, Norman, OK.
Ardith Parker Leming, great-granddaughter of Quanah Parker, Sulphur, OK.
Nocona Burgess, great-great-grandson of Quanah Parker and major Comanche artist, Santa Fe, NM. Bob Saul, President, History Partners, Fort Worth, TX. Would you like to help bring a film premier to another city not listed above? Please let us know. Use the order form below to reserve your film premier tickets in one of these locations, order the film's commemorative poster, or buy The Last Comanche Chief (signed by the author, Bill Neeley). The poster is 16"x20", with a stipple drawing of Quanah Parker by young Comanche artist Austin McClung, a great-great-great-grandson of Quanah Parker. Buy a poster and save $30 on a ticket! The Last Comanche Chief: The Life and Times of Quanah Parker by Bill Neeley is the seminal book on Chief Quanah Parker. Buy a signed paperback book and save $10 on a premier ticket! Library Journal said "The special merits of Neeley's work include its reliance on primary sources and illuminating descriptions of interactions among Southern Plains people, Native and white." For film premier tickets, you are making a reservation. Your card will not be charged until September 1, 2019. We will contact you via email in late August to provide the option to cancel. Posters and books will be billed when shipped. Film Premier Tickets - Fall 2019 ($80) Commemorative Poster ($40) - Buy a poster and save $30 on a ticket! The Last Comanche Chief: The Life and Times of Quanah Parker (signed paperback book) ($30) - Buy a book and save $10 on a ticket!